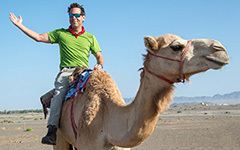 The 2019 Rock Music Oman program has traversed from Muscat through the mountains and on to the desert. 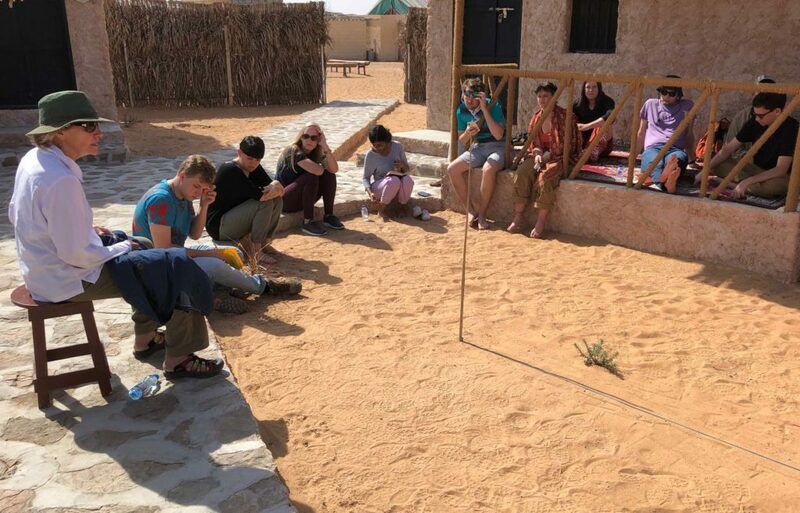 Last week, we were tucked in at a desert camp in the Sharqiya Sands, a vast dune complex, for a day of rest and reflection. 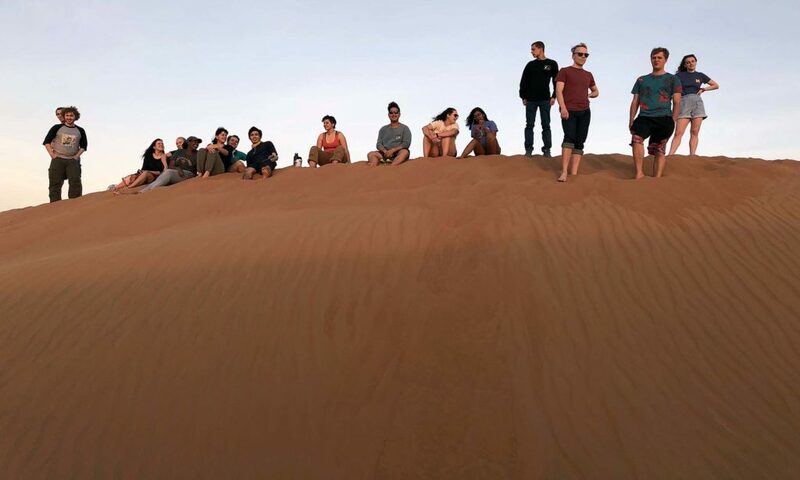 William & Mary’s Oman scholar-adventurers watching the sunset in the Sharqiya Sands. Our date palm staff was inserted upright into the sand, casting a shadow, while a nylon cord was extended northward from the staff such that it makes a north-south line. It was an improvised sundial. Local noon occurs when the sun is directly to the south, and thus its shadow points north. 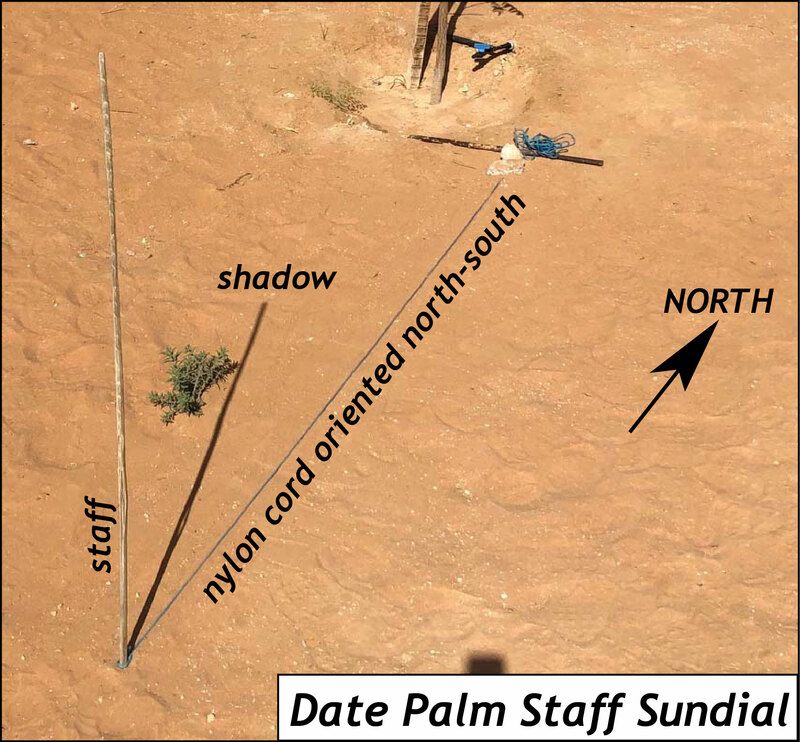 Once the date palm staff shadow is directly aligned with our length of cord oriented north/south, we have arrived at local noon. Waiting for the sun’s shadow to point north is about as exciting as watching paint dry! The excitement builds as local noon approaches. On January 10th, based on our observations local noon at the desert camp in the Sharqiya Sands occurred at 8:14 UTC. Oman is east of the Prime Meridian in southeastern England, so timewise we were ahead. The next step was to determine the time difference between the Prime Meridian and our location. Longitude and time are related. It takes 24 hours for Earth to rotate 360˚, thus 360˚ of longitude/ 24 hours = 15˚ of longitude/ hour. The solar elevation angle is simply the sun’s angle above the horizon. On January 10th, at local noon in the Sharqiya Sands, Ψ was 45.5˚. At the sub-solar point, the sun is directly overhead (90˚) at local noon, and for every degree of latitude away from the sub-solar point the sun’s angle decreases by a degree. From this relationship, we determined our angular distance from the sub-solar point by 90˚ – 45.5˚ = 44.5˚. My field notes from our solar elevation angle measurements. 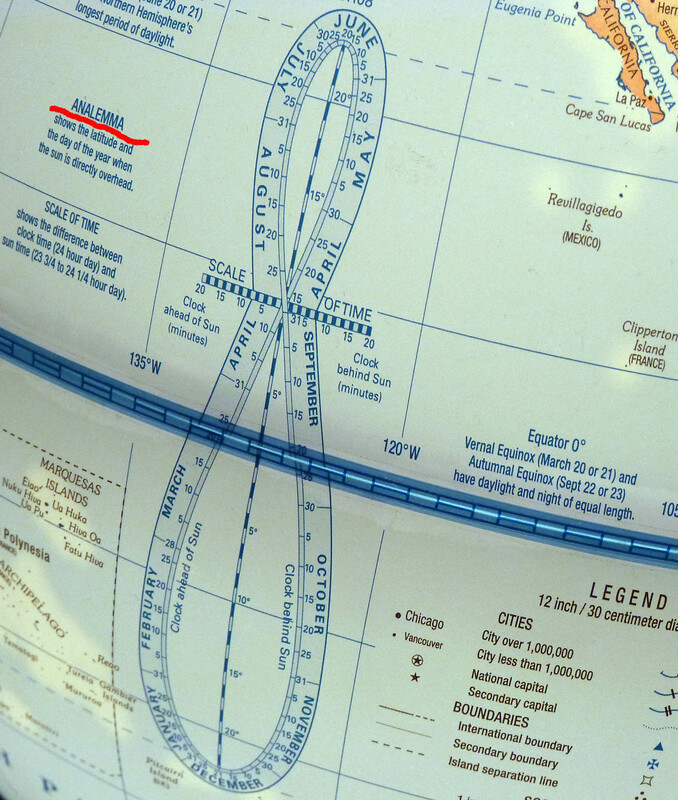 That’s where the analemma comes in handy, as it tracks the position of the sub-solar point throughout the year. On January 10th, the sun’s sub-solar point was at 22˚ S. Our latitude was 44.5˚ to the north of the sub-solar point which comes out to 22.5˚ North (44.5˚ = 22˚ S + 22.5˚ N). 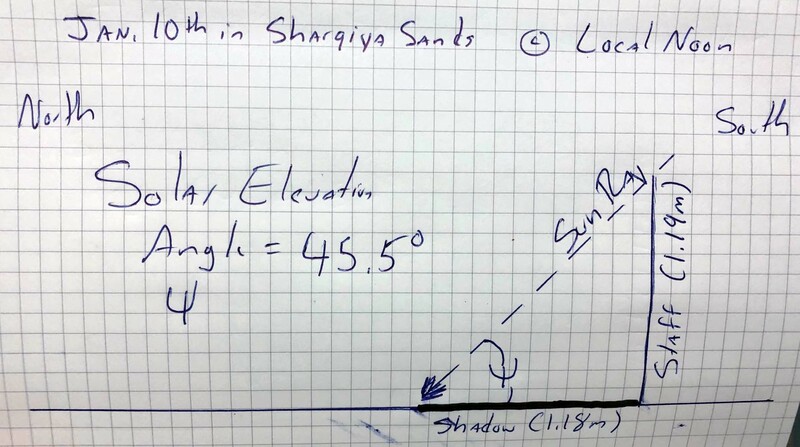 Our estimated position in the Sharqiya Sands was 56.5˚ East and 22.5˚ North. This placed us at nearly the correct latitude, but some 200 kilometers to the east of our actual location and nowhere near the Sharqiya Sands. Yikes! The analemma illustrates both the sub-solar point and whether the sun is ahead or behind clock time. However, we made one correction to our longitude estimate. As the Earth travels along its elliptical orbit around the Sun, its speed varies throughout the year. Thus, the sun can be either ahead or behind a clock – this difference is known as the equation of time. Once again, the analemma is here for us as its figure-8 shape illustrates the time difference between the sun’s position and clock time. On January 10th, the sun was slow relative to local time, it was 7.35 minutes (0.1225 hours = 1.8˚ longitude) slow. 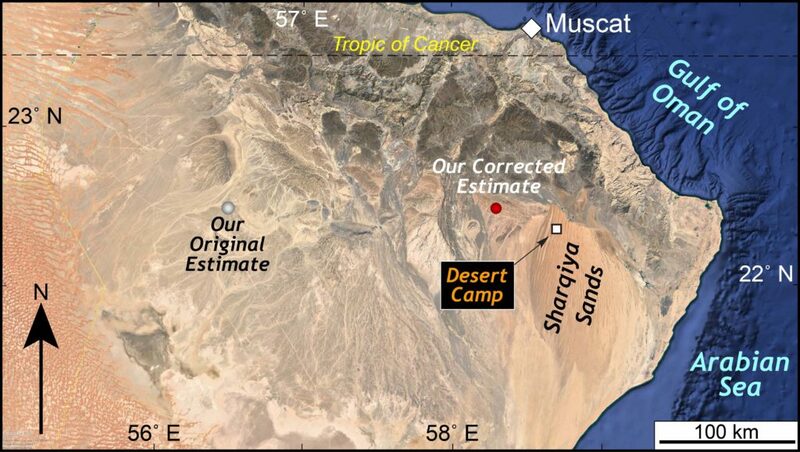 Thus, we added 1.8˚of longitude to our position (56.5 + 1.8˚) which yields a final estimate of 58.3˚ E.
Generalized map of northern Oman with our position estimates and the desert camp location in the Sharqiya Sands. Our corrected position estimate in the Sharqiya Sands was 58.3˚ East and 22.5˚ North. This was 45 km west-northwest of our actual location (58.7˚ E and 22.4˚ N). With a sextant, rather than a sundial constructed from a nearly (but not absolutely straight) date palm staff, we could no doubt do a better job. But it’s a big world, and all things considered, we weren’t far off in finding ourselves – not bad for a relaxing day in the dunes of Oman. P.S.- By the time this is posted, William & Mary’s spring semester will have begun and we’ll all be back from Oman, but check back over the next few weeks for the recap of our adventures from the 2019 Rock Music Oman program.